Remember when we said an Intel chip with AMD graphics inside was just wishful thinking? We were skeptical – and rightly so – but, apparently, wishes do come true on occasion. AMD have just confirmed they are working with Intel to create a new eighth generation premium mobile processor with Radeon graphics. Can’t decide on a desktop chip? We’re here to help with the best CPUs for gaming. It’s been a busy year, with AMD making a rare return to form at the start of Q1, to Intel rushing out a launch of their own at the end of the year in response – the status quo has certainly taken a hit. It’s only fitting that we have an announcement before the year is out that these rival companies are working together for the first time in decades – it’s been a weird year, after all. The latest chip, possibly named Kaby Lake G, from the purple team (claiming that name early) is intended for mobile application, specifically within lightweight and thin laptops. 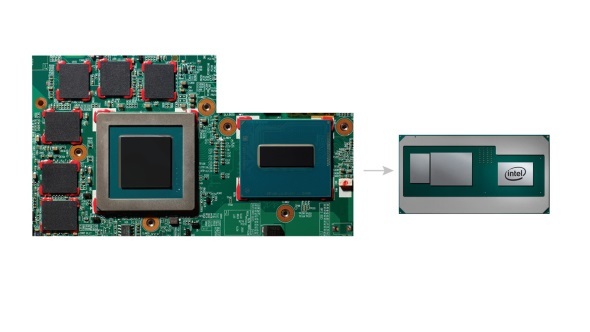 To achieve this departure from Intel’s usual integrated graphics fare, or Nvidia discrete GPU chips, they are utilising a new data and power sharing tech that connects multiple dies into the same package. Sound familiar? AMD have been utilising package substrate connectivity between multiple dies for the best part of a year now with their ‘glued-together’ Threadripper and EPYC products. It’s no revolutionary idea, however, and the concept has been put into use a fair few times previously and to varying degrees of success. 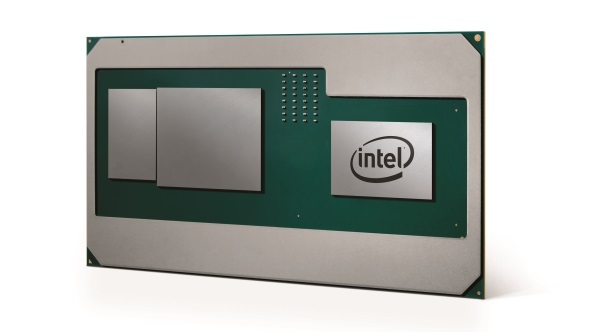 Intel’s latest version of this tech, the Embedded Multi-Die Interconnect Bridge, or EMIB for short, will bring an Intel CPU and semi-custom (likely Vega-based, from the HMB2-connected GPU in the image) Radeon GPU into the same package, alongside stacked HBM2 memory. Intel are also utilising a unique power sharing framework tailor made for this ungodly combination of Intel and AMD discrete dies. 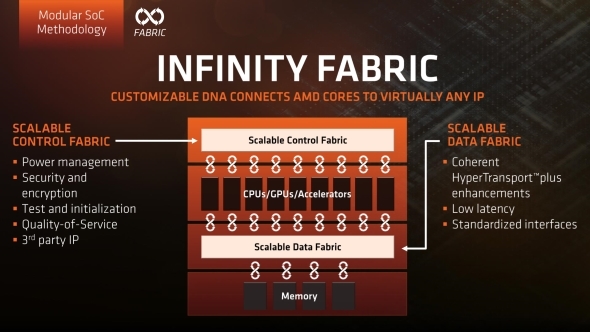 This allows for real-time monitoring of temperature, power, and performance – yet again, not unlike AMD’s Infinity Fabric. These may sound similar to AMD’s APUs, but, at least at a manufacturing level, they aren’t quite the same. Rather than all the components within one die, as is the case with AMD’s APUs, the Intel package features multiple chips combined through the package substrate. These products initially seem awfully close to occupying the same market territory. Targeting high-performance, yet ultra-slim and power efficient laptops and 2-in-1s, has made up the initial focus of their soon-to-release Raven Ridge APU. However, it seems Intel are targeting a higher performance bracket than AMD are with Raven Ridge, looking instead to replace their reliance on Nvidia discrete GPUs for performance mobile graphics. With a likely much higher price tag, and higher TDP on these new Intel/AMD hybrids, AMD’s Raven Ridge is still sitting pretty as an all-in-one iGPU competitor at only 15W – at least as it stands today. “Our collaboration with Intel expands the installed base for AMD Radeon GPUs and brings to market a differentiated solution for high-performance graphics” Scott Herkelman says, vice president and general manager of Radeon Technologies Group. While I’m sure a little Intel money is an incredibly persuasive argument alone, AMD are likely to benefit from the increase share than Intel can offer them for their Radeon graphics tech, while at the same time forcing competitors Nvidia to hitch another ride somewhere that isn’t off Intel’s back. It seems the murmurs of collaboration were true after all, although I doubt unsuspecting Mr. Vega over at Intel had much to do with it at the time. Intel and AMD are combining to stick it to their common foe, Nvidia. Just how long this potentially lengthy partnership will last is unknown, yet both sides are benefiting from their newly-formed alliance, set to give AMD a potentially huge boost to GPU sales, and Intel the chance to reduce the discrete graphics hegemony of Nvidia over Intel-powered laptops.